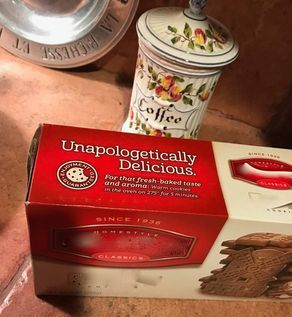 Recently I saw this advertising ploy on a package of cookies that I usually enjoy: Unapologetically Delicious. First, I must say that the word, unapologetically, is a very lonnnng word. Eight syllables long. The size of the box had to almost be extended to accommodate the word. Secondly, why apologize? Why not just say: Delicious! or Very Delicious! or Super Delicious! 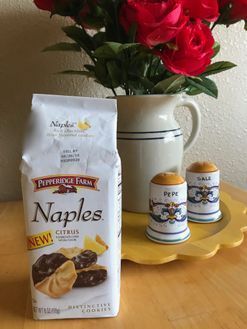 I believe there are a few reasons why advertisers would presume that the cookie-buyer and the cookie-eater in the USA would have to feel somehow chastened for the act of consuming a cookie so delicious that a sense of conscience had to be called into play. * All cookies must be treated equally, with hard-as-a-rock cookies that break your teeth being just as good as the soft cookies that melt-in-your-mouth. The stifling label of class equality has now been stuck onto your cookie jar. * If you are what you eat, you certainly are how you look at what you eat. And if you presume that a delicious cookie needs no apologies, why, it’s become un-American! * The appeal to the masses has gotten so massive that now the advertiser has to sidle up slowly and, er, apologetically, to the bar of greatness. It’s Great! has become Everything is Great, but this Box of Cookies is Unapologetically Great! The world of cookies has crumbled in America. It’s a complete mess. 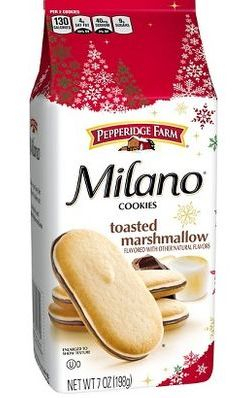 Pepperidge Farm Lidos have vanished, never to return. I can find them only in Google images. They make an appearance once a year, in the Holiday Assortment Pack, at vastly reduced size and greatly increased price. 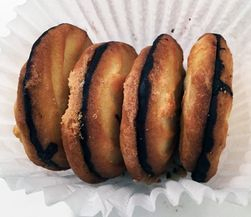 Milanos, however, have taken on every flavor and festive occasion known to this nation. And, yes, in my super-taster opinion, Lidos are better than Milanos. 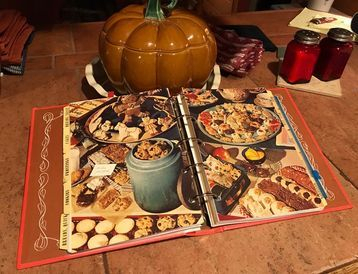 Mother’s Cookies are things Mother would not recognize as her own. Recipes have been sold and bought and re-formulated and re-packaged but the package says “Crunchy and Distinctive.” Cookie Crumbs! The oatmeal cookies are very hard, wafer-thin and they disintegrate upon dunking. The only distinctive quality is their lack of quality. Stella D’oro Margherites are half the thickness of their former selves, and about two inches have been lopped off of the length. I used to feel guilty eating more than two of them. Now four of them cause me no pangs of conscience. And they are, I taste-sense, a bit pasty. The fidgety conscience that goes into concocting the phoney advertising ploy ought to be applied to the making of these petits gâteaux. Ripping off the customer is not ethical. I know how often it happens; thus, I’m a consummate consumer realist. I’m not asking for truth in advertising. That request is, I realize, beyond the pale. And yet, I do protest! Advertising is an unabashedly American invention. Warts and all, it’s a creation that used to be innovative, fanciful, fun. The masses, and I as well, used to enjoy advertising for its ripe blend of flagrant truth, inescapable exaggeration, hilarious humor, and enchanting enticement to try It, buy It: You won’t regret It or deny It. We in the USA are now “treated” to . . . Unapologetically Delicious!? I realize that the advertisers must diligently work with the times wherein they exist. Eating the entire Sara Lee cheese cake during the 1990s was deemed “inappropriate” and so They came up with those mini-things that dried out in the freezer. Since those halcyon days when Dinosaur Grahams still stalked the preschool earth, the nexus between company and consumer has become a bridge that’s been burned, by the advertisers. I know that love can build a bridge; I also know that what’s inside the package ought to match what’s hawked on the outside of the package. Maybe the Suits can reconstruct that span before this decade comes to an end. Size, taste, texture, and price in relation to quality — those tangibles all matter! Given the way these cookies crumble, baking cookies may yet come back into vogue! Because of my aversion to Digital Yellow Journalism, I have taken to asking Dear Husband for any crisis updates, news that really affects me. 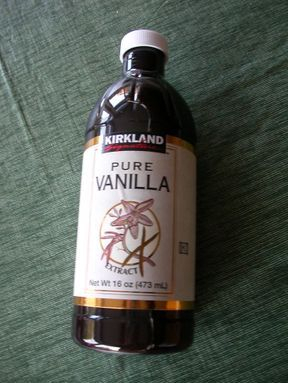 This bit, or bite, of current events intersects with my request for another bottle of pure vanilla extract, the natural stuff from Madagascar. We buy this product approximately every 2 years so it’s not a high-demand commodity for me. Evidently, it is for others! Today, I learned about the crisis of the Vanilla Bean Shortage. 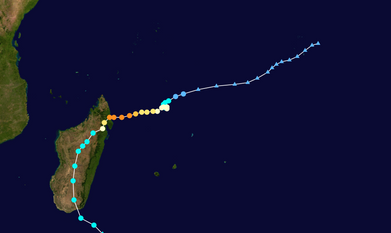 A cyclone hit the island of Madagascar in March 2017. It went almost smack dab through the middle of this producer of 80% of the world’s vanilla supply. Cyclone Enawo wiped out the entire crop. During the tumultuous event-filled year of 2017, I did tune in and turn on to American News, but I guess that foreign tragedy was overlooked because of the political coverage of unglued hysteria, the major foodstuff of News Media everywhere. I saw nothing, zip, zero, nada about this horrid and unquestionably consequential occurrence. It is now more expensive for vanilla ice cream manufacturers to buy the vanilla bean than to purchase the dairy products and sugar for the cream-up. It was also easier for me to find a granite counter-top than quality vanilla from Madagascar! This past summer, I visited the local counter-top fabricator and I immediately spotted the slab for my new kitchen island. This expanse of hefty stone is called Belize and it is straight from Madagascar! 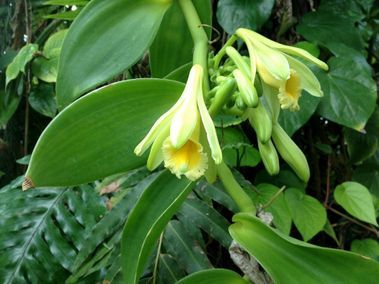 Vanilla competitors recommend the use of “alternative extracts” — non-GMO of course. The good news is the price has peaked ($35 for a 16-ounce bottle) and the vanilla bean crop in Madagascar is attempting a bold recovery. The less good news is that the world stockpiles of the vanilla bean were depleted while the price sky-rocketed. Who knew?! Who even had a chance to know? So much for Media Business Channels! I had to research arcane online business “journals” and online food/recipe sites to find this information. The vanilla bean price quadrupled during the last four years. 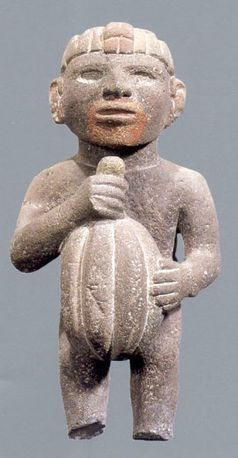 There was also a cacao bean shortage during 2017 due to an El Niño creating an El Problemo along the equator. Climate-change-crybabies predict chocolate will be extinct in 30 years, but I daresay they and their junk science will be the first to go! They could use some dark chocolate right now! Couple those deficiencies of dream-making ingredients with a worldwide shortage of raw materials for various makeup shades, paints, and any other products dependent on dyes, and the cookie is crumbling faster than I’d thought! There is always the third choice, strawberry, in terms of traditional ice-cream flavors, but the strawberry crop in California this past spring was anemic. I now hear that lemon is the new vanilla! 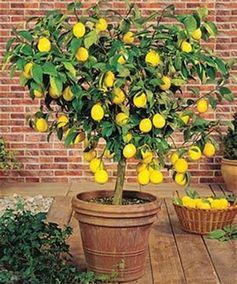 I shall cling to my potted Meyer lemon tree more tenderly!